14k gold custom made station necklace consisting of 50 baguette shape, natural diamonds , weighing 1.20 - 1.35 carats (cttw). The stones color and clarity ranging J-K and I1-I2 respectively, according to GIA grading scale. 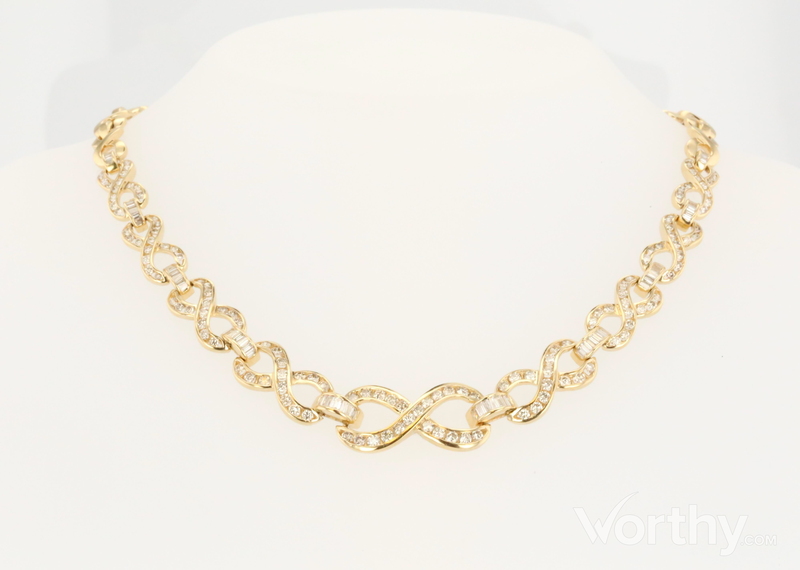 Ladies 14 kt yellow gold 17 inch long Infinity Link design necklace that measures 13 mm wide and graduates to to 7.0mm wide. The center 9 links are channel set with full cut round diamonds with connected with half round links that are channel set with straight and tapered baguette diamonds. Note: Several of the baguette diamonds are chipped.